Catherine “Kate” Barnard (1875-1930) — Social Reformer, Political and Labor Activist, and First Woman Elected to a State Office as Commissioner of the Oklahoma Conference of Charities and Corrections. Editor’s Note: This entry is a composite of information from two sources, which are listed below. Catherine “Kate” Barnard was born born in Geneva, Nebraska on May 23, 1875 to John and Rachael (Shiell Mason) Barnard. Kate Barnard’s mother died before she was two years old and she spent most of her lonely childhood in Kansas, where family dislocation and financial failure darkened her early life. Her first job was as a teacher in an Oklahoma City public school, where she became acquainted with the plight of poor immigrants who were moving into the territory. One of her efforts resulted in a clothing drive that generated over 10,000 garments that were distributed to the poor. She left teaching to attend business college and later got a job as a stenographer and clerk with the Territorial Legislature in Guthrie, OK. In 1904 she was selected from 500 other applicants to represent Oklahoma at the World’s Fair in St. Louis, MO. While there she met and became acquainted with prominent social reformers such as Jane Addams and had the opportunity to tour the city’s slums. Her experiences motivated her to return home and become more deeply involved in alleviating the conditions of poverty and immigrants in her own city. 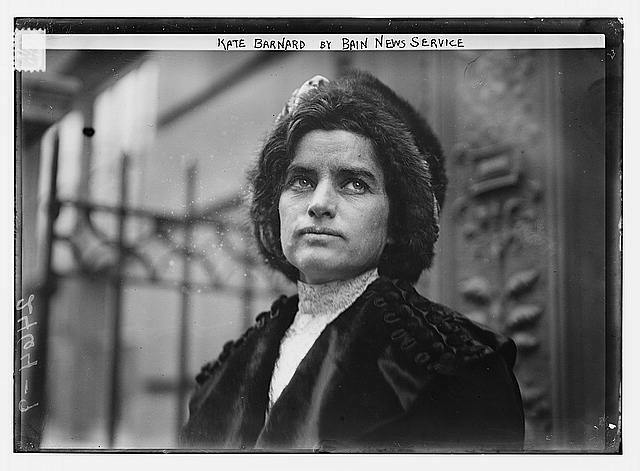 Barnard became an active spokesperson advocating for child labor laws, a compulsory school attendance law, a juvenile justice system, and a modern penal structure. In 1907, at age thirty-two, she became the first woman in the nation elected to a state post—Commissioner of Charities and Corrections, a post created specifically for her by Oklahoma’s constitutional convention. Her dramatic rhetoric and favorable publicity attracted national attention and the admiration of Oklahomans. She was a regular speaker at regional and national professional associations, including the National Conference of Charities and Corrections. In 1906, as Oklahoma’s status was changing from a territory to state, Barnard traveled to the slums, factories, and sweatshops of the East Coast in order to learn what eastern states were doing to protect working women and children. Her goal was to incorporate laws into the state constitution of Oklahoma. Although women could not serve in the constitutional assembly, Barnard was allowed to address the group and wrote articles for the Daily Oklahoman. Barnard also had a major role in writing the state’s constitution. She became administrator of the United Provident Association (later the United Way) in 1905, and served as Oklahoma’s first Commissioner of Charities and Corrections from 1907-1914, serving for two terms. Barnard organized a chapter of the Women’s International Union Label League and became the union’s representative to the Oklahoma City Trades and Labor Association. She also lobbied to raise the minimum wage from $1.25 to $2.25 a day. In 1909, Oklahoma passed a child labor bill written by Kate Barnard. Barnard taught briefly, and then attended a course in business school. She went to work for the Oklahoma state legislature in 1903. In 1904 Barnard was selected to oversee the Oklahoma pavilion at the St. Louis World’s Fair. During her one-year tenure there, she attended the Chicago School of Civics and Philanthropy and became involved in social work. When she returned to Oklahoma City, she began her work on behalf of the poor with the United Provident Association. Barnard organized clothing drives and volunteers to clothe and feed the poor in Oklahoma City’s neighborhoods and wrote articles about visiting the poor and dying for the Daily Oklahoman. She bought books for children and encouraged school attendance. The Epworth University College of Medicine established a clinic on her property. Her duties as Commissioner of Charities and Corrections led to visits and inspections of Oklahoma’s jails, poorhouses, orphanages, institutions for the deaf, blind and insane. She was a vigorous proponent of reforms. Her concern about prison conditions led to an anonymous visit in Kansas (Oklahoma Territory had not yet built prisons) during which she paid an admission fee for a prison tour. Her findings of severe abuse led to the return of Oklahoma prisoners to local facilities. Her political career ended during her second term in office, after she began to advocate on behalf of Native American wards who were being cheated out of their land as a result of graft. The land had been ceded by the federal government to Native American individuals and was held in trust for minors. However, guardianship was held by the probate courts, which led to a great deal of exploitation. Her work on behalf of Native American children and the exposure of this graft raised the ire of prominent Oklahoma businessmen and officials who convinced the state legislature to defund her office. Prior to the defunding, Barnard was responsible for the restoration of over a million dollars to the Native American community. Barnard made one last attempt on behalf of Native American children in 1915 when she formed the People’s Lobby. However, her influence had evaporated in Oklahoma. Kate Barnard left office and spent the remaining 15 years of her life in poor health. She was hospitalized for physical ailments, suffered tuberculosis and spent time in sanatoria for neurological and mental health conditions. Although she had begun an autobiography in the final months of her life, it was never completed. When she died in 1930, more than 1,400 people attended her funeral in recognition of her many contributions. In 1982, Barnard was inducted into the Oklahoma Women’s Hall of Fame and in 1999, the Oklahoma Commission on the Status of Women established the Kate Barnard Award to honor women in public service. In 2001, a statue of Kate Barnard was dedicated in the state capitol building. Edmonson, L. & Larason, M. (2000). Kate Barnard: The story of a woman politician. Chronicles of Oklahoma, 78(2), 160-181. I love how she didn’t need one female vote to win – All MALE! It was a great step forward for most women.